Has this ever happened to you? You’re browsing the packed racks at your favorite thrift and you find something fantastic. It’s everything you could ask for in a dress (or blouse, or shirt, or table cloth, etc.) and lo and behold, it looks like it might fit. But then, you notice it. A stain. Or maybe two. Sadly, you return the item to the rack, heart heavy and cart light. Once upon a time, this used to be me. But no more! I’ve learned that with the right tools and a little elbow grease, pesky stains don’t have to stand between you and your thrifted treasure. Here’s a very basic, step-by-step how-to that’ll help you get going. READ: These tips are for basic fabrics, i.e. cotton, polyester, linen, denim, etc. SILK, WOOL and LEATHER require extra TLC, a topic I shall tackle in other posts. 1. Get up close and personal with the stain. Look at it closely. Scratch at it. Sniff it. (Just kidding, that’s gross!). Bring the garment or fabric to the window and look at it under natural light. 2. If your stain appears to be from sweat (common in the underarm and collar areas) or blood, you may have to relinquish your thrifted find back to the rack. Once sweat or blood has set in (and on some vintage pieces, they could have been there for 20+ years), it’s game over. At least it has been in my personal experience. Wah, wah. Sniff, sniff. There are other fish in the sea. 3. If the stain seems to be of the food, grass or miscellaneous variety, you’ve got the green light to buy! When it comes time to check out, don’t be shy about pointing out the blemish and asking for a better, more fair price. After all, you’ve got some work to do! 1. Pick a pre-treater. I’ve tried 70 percent of what’s on the market, and my ultimate, no. 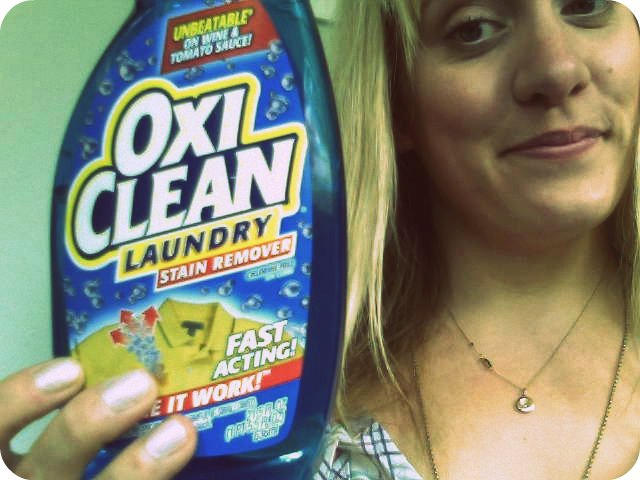 1 favorite go-to stain remover is this. It’s magical. It works awesome on everything EXCEPT silk, silk blends, wool, wool blends and anything labeled dry clean only. 2. Scrape or scratch off as much of the stain as you can and then soak that sucker with the pre-treater. Once the fabric is saturated, I like to rub the pre-treater into the fabric with my finger so it really gets in the fiber. Make sure to stick a rag or paper towel underneath the layer with the stain to absorb the dirty if/when the stain starts to comes out. 4. Once 10 minutes go by, start your washer. I wash most everything in cold water on the most gentle cycle. Add in your regular ole detergent (I use Tide plus Febreze Freshness), and then your stained stuff. 5. Let your machine do its thing. Tumble dry more durable pieces (like jeans or linens) on low and lay delicate items flat to dry. Hopefully your thrifted stuff is stain-free and ready-to-use! Whoo-hoo! 1. If you’ve found a delicate or fragile looking item, use common sense and take it to a professional dry cleaner. 2. Want some eco-friendly options? I was surprised that mainstream “green” lines, like Method and Seventh Generation, don’t sell any kind of pre-treaters or stain removers. I did find the recipes for two D.I.Y. non-toxic stain removers, though, if that sort of thing is up your alley. I hope this how-to was helpful! If you have any stain-removal tips, please do share! 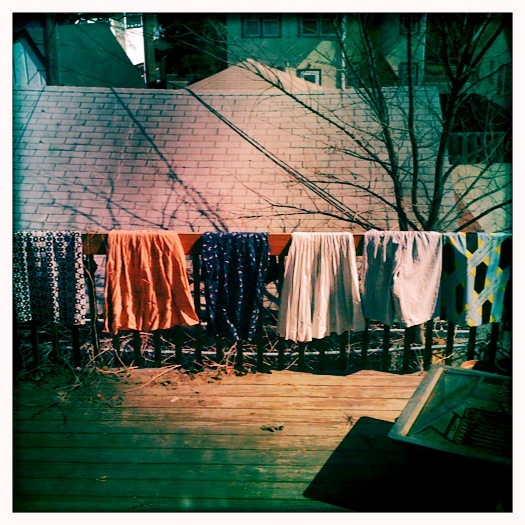 This entry was posted in How-Tos and tagged how to, thrifting, vintage by highplainsthrifter. Bookmark the permalink.